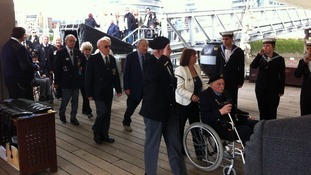 Glen Goodman went aboard the WW2 cruiser on the Thames which reopened to the public today. HMS Belfast has reopened to the public six months after the walkway which connected it to the shore collapsed. An investigation found that workmen had cut through part of it by accident. The cruiser's director Phil Reed explained to Glen Goodman how the walkway had been replaced. HMS Belfast is reopening today, six months after it was closed to the public after its gangway collapsed. An investigation found the accident was caused when a subcontractor cut through the gangway during renovation work. HMS Belfast will welcome back visitors to her historic decks next month. The ship, docked on the Thames, has been closed to the public for six months after the gangway collapsed. It'll be open from May 18th.